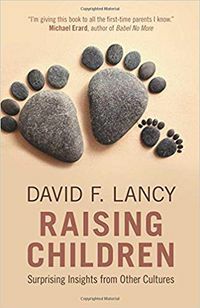 David Lancy’s Raising Children: Surprising Insights from Other Cultures from Cambridge University Press is an anthropological study of childhood that reiterates and reinforces what we already know about parenting practices in the West. He emphasizes that our educative and protective modes of childrearing expect too much in the present and assume too much about the future. He starts by explaining that childhood as a part of life development is a modern invention, and Lancy articulates a concern that parents in developed societies have packaged growing up into a notion of normalcy that stands on shaky evidence. His method is comparative and particularly focused on the differences between Western practices and Village practices in raising children. The umbrella term he uses for the West is neontocracy, which is a society that prioritizes the needs of children. Conversely, in gerontocracies, adults are privileged and powerful. Lancy further provokes neontocracies as WEIRD – an acronym for Western, Educated, Industrialized, Rich, and Democratic – suggesting that the universalism of Western individualization and the particularism of Village communitarian values implicate liberalism’s unequal distribution of wealth which impacts how children are raised around the world. Modernized WEIRD societies compel childrearing prescriptions with significant consequences to the well-being and future possibilities of children in all cultures. Therefore, experts who have claimed authority over both human development and the ideal family structure are part of WEIRD societies. As a result, parenting and childrearing practices have become learned as natural and healthy while, in the gerontocracy, practices appear to the West as unnatural and morally bankrupt. Lancy aims to raise suspicion over the valuing one mode of raising children over others. He says, “The goal is not to pit these ideas against each other to see who wins, but to tease out dramatic points of contrast, and to ask of the past, how were children raised?” Lancy asks readers to judge based on the evidence rather than on disciplined learning. Raising Children describes three different archetypes of early childhood. Lancy names children that are loved and overprotected the cherubs. They belong to categories typical in WEIRD societies. Chattel children are those in societies where fertility and having many children is desired, and so, too, is their survival for the future productive benefit. Changelings are disposable for being more of a burden than a value. Each ideal child can be socially understood through the patterns of care they receive. Chattels and cherubs are closely attended to, but for different reasons, whereas changelings may be ignored or even tossed aside to fend for themselves. Nonetheless, says Lancy, “Many, perhaps the majority, of the world’s societies follow customs designed to improve the child’s prospects.”  Remarkably, this is the only similarity presented, suggesting the tenacity of the book as a critique of neoliberalism’s influence on family structures and styles. Interrogating the rise of the policing of families through the notion that parents and children must physically and emotionally attach to each other, Lancy raises concerns about the medicalization of children. Whereas in the gerontocracy, elders and adults are prioritized and should be served by their children, in the neontocracy adults are expected to monitor, provide care, and support every desire of their children. This is a tension between attachment and detachment theories. According to Lancy, ‘Attachment theories’ have produced discourses of the emotionally disturbed child. He says, “In my own survey of sources from cultural anthropology, history, and archaeology, this perceived risk is absent.” In the West attachment as a moral obligation explains strict social policies. Elsewhere, Village children may be left alone for long periods of time, not only without harm but often to their own benefit. Lancy’s discussion on schooling begins with the story of the ‘clueless snowboarder.’ Hearing this young man’s frustration in not knowing what to do, Lancy articulates that the snowboarder made no effort to observe and mimic what others were doing. Lancy argues that some learning demands are quite unnatural for WEIRD children, whereas parents in village societies rely on engagement with the natural world to produce an educative force. Immigration generates a significant problem related to this cultural difference. Lancy says, “In elementary schools in Denmark, Danish kids are ‘calm’ while immigrants are ‘wild.’ Teachers use scolding and guilt to tame the wild ones.” He discusses Matses children in Peru and Chaga children in Tanzania to reveal their capacity to act in and on the world while they struggle with transitions taking place with schooling. When this failure to perform traditional schoolwork happens in the West, it is cause for intervention to diagnose the learning disorder. Lancy argues that education should not be a forced treatment, but a somewhat hands-off approach with encouragement. In other words, the human species can and will accomplish what needs to be done for survival through observation and mimicry. There can be detrimental effects of the neontocracy where children are individualized, and at the same time, everybody can be the winner. Considered unique and similar, WEIRD children are born into a culture of overconsumption and regimented activities. Family dinners no longer exist because the kids have sports and ballet practices. The newest and the most popular clothes and technologies are in high demand. In the Village children are not raised to be unique, but rather to fit in, to be respectful, and to remain in their low station until they can contribute to productive efforts. The significance in these differences relates to what Lancy terms the “failure-to-launch.” WEIRD children mature without the requisite skills to function in daily life without parental help. This problem can be associated with constructing the “normal” child in the West versus the “neglected” child in the Village. Lancy seems to suggest that these interpretations of childhood should be reversed. Lancy recapitulates his argument by suspecting that WEIRD societies are failing children in their efforts to prescribe every aspect of their lives. He says, “I am very concerned about the ready ascription of failure or inadequacy to parents. The root of this problem lies in our contemporary culture’s false understanding of what is ‘normal’ in parenting and child development. Childhood, as we now know it, is a thoroughly modern invention.” This experiment as he calls it has boxed children into a world of extraordinary expectations and unachievable aspirations that do not fit the natural human animal. Most importantly, what is generative about the book is that in all the ways that children might learn and grow, most turn out to be just fine. For readers, this will raise the common but important question in raising children: how do we find the right balance between protection and freedom, between supporting and letting them be? To me, this suggests that the free-range movement that has been underway for the past decade is a move in the right direction for the prospects of WEIRD children.